From Solihull to Stamford Hill – anti-Muslim and anti-Jewish hate will be opposed! It’s unfortunate for the ‘new right’ of the EDL and the anti-Muslim ‘counter-Jihad’ movement, that as much as they constantly proclaim that they “aren’t racist because Islam isn’t a race” (© every racist ever), old-fashioned neo-Nazi Jew-haters keep popping up to remind everyone that all the same arguments they use against Muslims have been used before against Jews. As a very good piece by Jewdas points out, all the same lies historically used by anti-Semites are now being applied to Muslims. And yet this Islamophobic hatred is far more culturally acceptable than anti-Semitism. Take the average rant about Islam from Britain First, the EDL, UKIP or the Daily Mail, switch all the words referring to Muslims and Islam to Jews and Judaism and see how much it sounds like the Nazis. This weekend has been very interesting for those opposing both anti-Jewish and anti-Muslim hate. 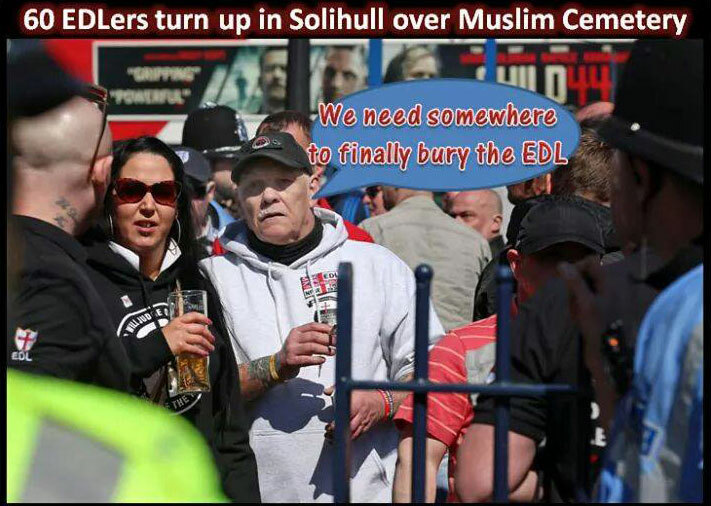 In Solihull the EDL held a demo to oppose a Muslim cemetery – how exactly this is supposed to have anything to do with the ‘Islamic extremism’ they are supposed to be focussed on is anyone’s guess. Can Muslims be ‘radicalised’ from beyond the grave? Or is it in fact more likely that the EDL just hate Muslims and would even deny them a place of rest in keeping with their own religion? Of course, it’s really just an excuse for another march around a British city intimidating and spreading hatred towards the Muslim residents of that town. Simultaneously, in East London, a small group of neo-Nazis tried to hold a march on Stamford Hill – the centre of largest Haredi community in Europe. This is the first time anything like this has happened in a long time and might suggest that although still tiny, the old-school extreme right is becoming more active. Proving the point that racism against anyone leads to more racism in general, mainstream anti-Muslim rhetoric has been the tool by which the Pandora’s box of racism has been opened, and now forms of racism we thought were dead and buried are popping back up. So the day before Holocaust Memorial Day – 70 years since the liberation of the camps and 72 years almost to the day since the Warsaw Ghetto uprising against transportation to Treblinka, we had the spectacle of Nazis marching on an Orthodox Jewish community in London. Anti-fascists took to the streets to stand against the fascists both in Solihull and Stamford Hill. 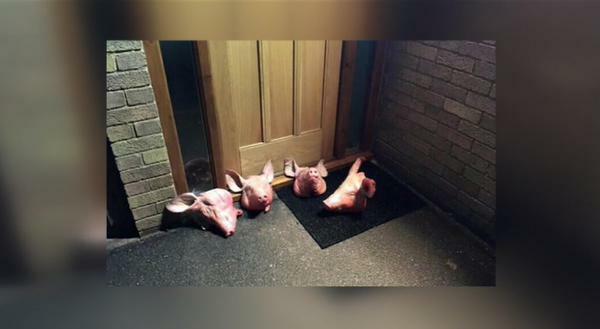 The week before the EDL Solihull demo saw windows smashed and severed pig’s heads dumped outside a community centre that was reported to be in use a mosque – merely because it was hired as a venue for a talk by a Muslim scholar. This shows the level of insane paranoia, ignorance and hatred that attaches itself to anything seeming a bit ‘muslim-y’. Unfortunately EDL rallies are often accompanied by this sort of attack. In advance of the EDL Solihull demo, it was downgraded to an ‘awareness raising event’ the EDL perhaps fearing they would not have enough numbers to pull off a march. On the day, approximately 60 EDL members were opposed by about 40 anti-fascists, from UAF and Midands Anti-Fascists. Members of Midlands Anti-Fascists confronted the EDL early on while they were drinking in O’Neill’s pub. This let to the EDL being kettled in the pub and prevented from leafletting. The group of 20 anti-fascists was kettled by police and moved away from the EDL. 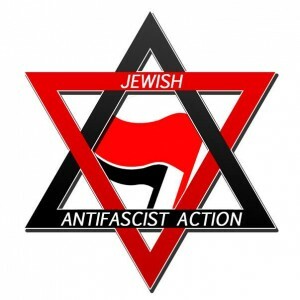 Meanwhile, in East London, the neo-Nazis were outnumbered at short notice by about 100 anti-fascists as they attempted to hold their anti-Semitic march on Stamford Hill. Activists from Jewdas, UAF, London Anti-Fascists, Dywizjon 161, South London Anti-Fascists and North London Anti-Fascists were joined by lots of locals to jeer and heckle the Nazis. The police did not let them march to Stamford Hill but directed them the other way. This was a victory of sorts but it was worrying that the police seemed to lead the fascists right to the largest mosque in Hackney and also that the police kettled and contained anti-fascists in order to enable the Nazis to march. There were somewhere in the region of 20-something neo-Nazis organised by renowed long time fascist Eddie Stampton. The crowd also included Martin Webster (ex-leader of the NF in its 1970s hey-day) and some members of Polish fascist group, the National Rebirth of Poland. The Nazi march only lasted a couple of hundred metres and less than an hour in total. The fight against racism, fascism and the far-right continues. Next Saturday 25th sees the far-right March for England descend on Blackpool after being finally chased out of Brighton by anti-fascists. Lets show them they are no more welcome in the north! Transport to Blackpool is running from Manchester, Newcastle, Sheffield and Leeds, among other places. Get in touch with your local AFN group or with opposemfe@riseup.net for details. 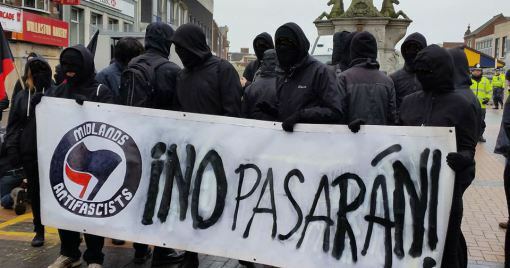 While in Brighton, anti-fascists are hosting an ‘international picnic’ on Sunday 26th to celebrate being fascist free for the first time in seven years after successfully deterring the March for England and also an EDL national demo – both of whom have pulled out of coming to Brighton. 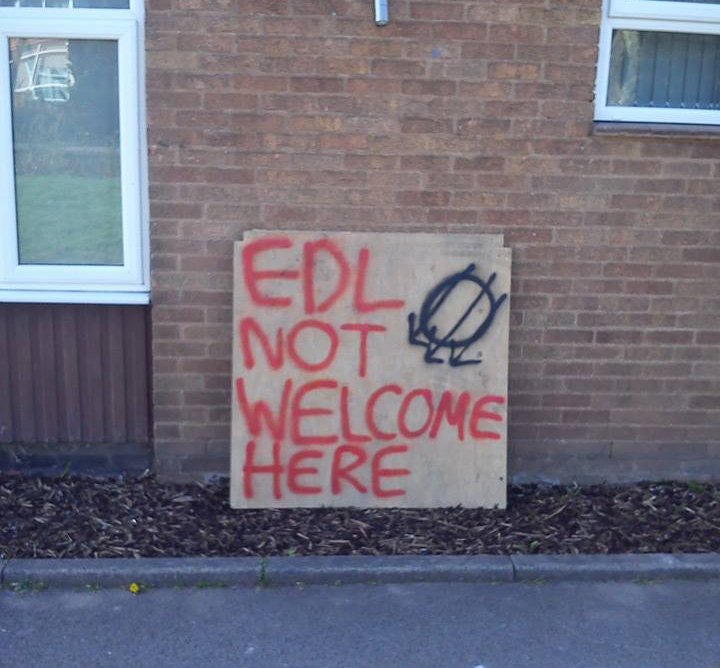 In the Midlands, the Spring of anti-fascism continues with mobilisations on Sat May 2nd in Coventry against the Infidels and Sat May 9th in Dudley against Britain First. While in the capital, fascists are next aiming to return to East London on May 9th with an EDL demo in Walthamstow. Last time they tried it in there, they were totally outmatched by a couple of thousand anti-fascists – Let’s chase them out of town again.